A true music album is now 3 equal elements together: Music + Graphics + Story = 3plet, a revolutionary app, the new music industry format. Add here Song Lyrics, Music Videos and integration with Facebook and Twitter and you get a wholistic digital piece of art, delivered to you straight from the artist! The New Era of music albums is here! More and more contented artists are publishing their new albums in the innovative 3plet format! 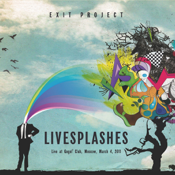 And here come the pioneers: luminous EXIT project present their new concert album “LiveSplashes”. The band's evocative masterpiece is groove-based and reflects increasing interpenetration of genres from jazz to world music to EDM. Thoughtful stories and each track commentary from the musicians themselves are accompanied with a collection of capturing graphics, band photography, and live videos. Try it, dig it, enjoy it!